Here are a couple of photos from within the Peraves MonoTracer Skunkworks in Winterthur, Switzerland of various MonoTracers undergoing assembly. 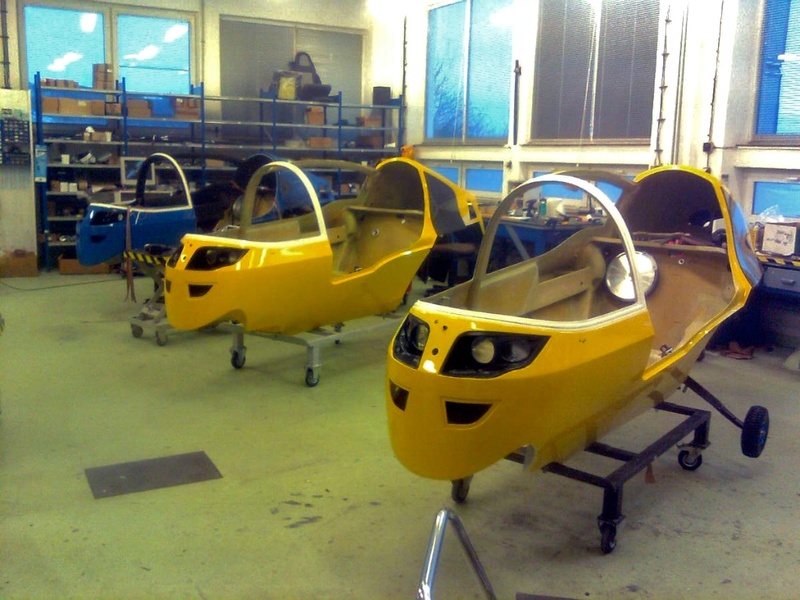 What is really exciting to see are two new pre-production MonoTracer-E vehicles, the two yellow ones with full carbon fiber package, in the build process. These two all electric MonoTracers are the pre-production validation vehicles and will sport 150kW AC Propulsion drive systems. Without the flush headlight covers the MonoTracers remind me a little bit of Terminators with the mechanical “eyeball” of the high intensity discharge (HID) lighting systems. MonoTracer assembly line at the MonoTracer Skunkworks in Winterthur, Switzerland. Two pre-production all electric "Speed Yellow" MonoTracer-Es with full Carbon Fiber Package undergoing assembly. This entry was posted in Peraves and tagged AC Propulsion, Factory, MonoTracer, MonoTracer E, skunkworks. Bookmark the permalink.